Sima Gandhi finds her tax law studies literally rewarding. 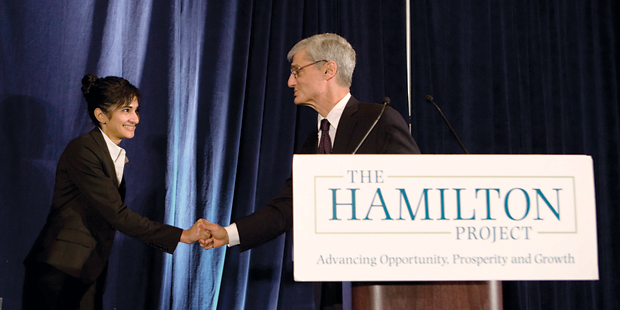 With Batchelder’s encouragement, Gandhi submitted a condensed version of the paper to the Brookings Institution, winning its inaugural Hamilton Project Economic Policy Innovation Prize for the most “innovative policy proposal” written by a graduate student; the selection committee included former Congressional Budget Office Director Alice Rivlin and former Treasury Secretary Robert Rubin. In addition to a $15,000 award, Gandhi was invited to a writer’s conference to help her turn her plan into a discussion paper published by the Hamilton Project.